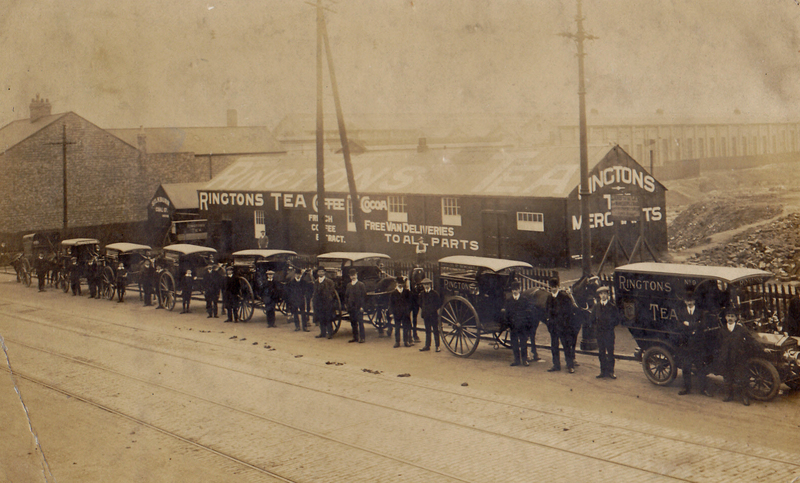 The imposing white brick Ringtons building on Algernon Road bears the date ‘1924’, indicating that the famous tea company has Heaton connections going back at least 90 years. In fact the story starts much earlier than that. Samuel Smith was born on 22 June 1872 in Leeds and christened on 22 December of that year along with his older brother, George. His parents were both local. William, his father, earned his living as a fettler, someone who cleaned the machinery in a woollen mill. According to Sam’s great granddaughter, Fiona Harrison, young Sam started work, aged eight, as a ‘butcher’s boy’ on Friday nights and Saturdays. Aged ten, he joined the staff of one of the country’s biggest tea-dealers, as a ‘half-timer’. He gradually worked his way up and was sent to various of the firm’s offices across Yorkshire to learn all aspects of the business. By the time he married Ada Emmerson, daughter of a Leeds milk dealer, at the age of 25, he was a travelling salesman for the company and was based in Sheffield. The couple’s two oldest children, John and Douglas, were born in Sheffield but the next two, Elizabeth and Vera, started life in Bradford and by time the youngest, Samuel and Harriet, came along, the family were back in Leeds but preparing for a new life in Newcastle. We are extremely lucky in that, not only did Sam keep letters, diaries, notes, photographs and mementos, but that his family have treasured them and Fiona has painstakingly combed through the family archive to help us piece together the story of the birth of Ringtons and its relevance to our ‘Heaton’s Avenues in Wartime’ Heritage Lottery Fund project. The records show that Sam had become increasingly disillusioned with the firm he worked for in Leeds. He felt its staff weren’t treated well and he believed that he could both run a successful company and live true to his values. His friend and colleague, Irishman William ‘Will’ Titterington, was of the same mind and they decided to set up in business together under the name of ‘Ringtons’, which combined the last part of Will’s surname with the first letter of Sam’s. As was common at the time, there was a clause in their contracts stipulating that if they left their current employer, they couldn’t set up within 50 miles of its Leeds headquarters. The two men weighed up their options and were initially tempted by Scarborough, but in the end they couldn’t ignore the excellent opportunities offered by industrial Tyneside, where, although there were already a number of tea dealers including Brooke Bond and Pumphrey’s, none of them delivered door to door, which Sam and Will planned to make their unique selling point, one which has stood the company in good stead right up to the present day. So it was in Heaton’s Avenues in 1907 that Ringtons was born. 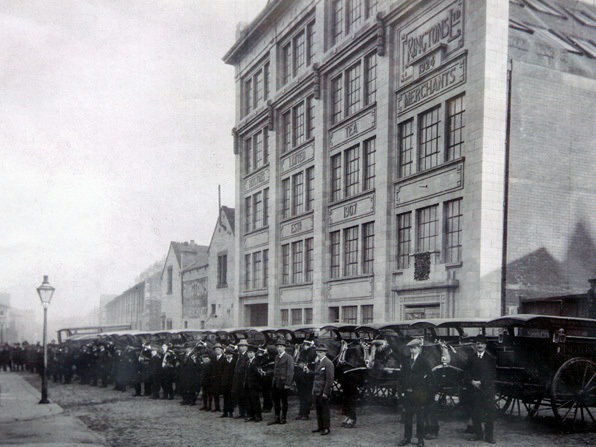 By 1908, the partners had two vans and four assistants and they were blending twice as much tea as a year earlier. The first mention of the firm in the trade directories is in 1909-10 (which was probably surveyed in 1907-8). Ringtons was based at number 23 Third Avenue with Sam Smith, manager, living at 25. By 1911, the Smiths had moved to 129 Warton Terrace. Will Titterington and his wife Mary were living at 109 Tynemouth Road with their sons, William jnr and Francis, aged six and four. 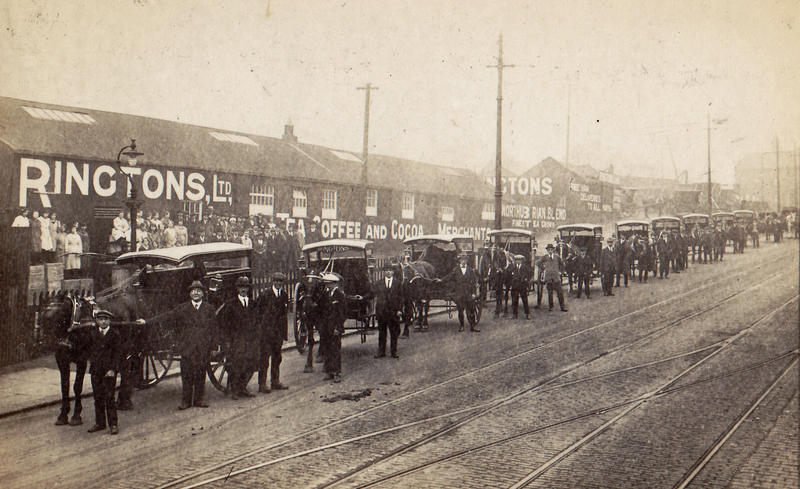 By 1910 Sam Smith had bought Will Titterington’s share of the company and the firm itself had moved to more spacious premises on an abandoned rifle range at 392 Shields Road (where the Byker retail park is now). Here, their neighbours included a coach builder, cart proprietor, horse keeper and horse shoer, all vital to the Ringtons’ enterprise. Sam had worked hard to make the business a success and it had gone from strength to strength. By this time, there were 11 vans and 11 assistants. What Sam hadn’t reckoned with were the severe food shortages and the resulting rationing and restrictions. There was a sugar shortage so people were only allowed to buy it where they bought their tea. Ringtons didn’t sell sugar and couldn’t get hold of it, so business plummeted. To compensate, the firm started to sell any foodstuff it could lay its hands on: tinned and evaporated milk, dried eggs, canned meat and fish, saccharine, pickles etc. However, often as soon as Sam had bought a consignment, the price of the commodity would be fixed by government at less than he’d paid for it. ‘ Somehow I managed to keep my promises to my soldier staff’ remembered Sam. ‘And somehow managed to relieve a little the distress of the widows of the three who never came back. But it was a fight to be able to pay my own rent and the wolf came nearer and nearer my door’. At the end of the war, the 12 surviving members of staff returned, ‘three of them wearing the Military Medal’ and, as promised, Sam took them back although the outlook for the company seemed bleak. But gradually, once people and retailers were free to buy and sell what and where they liked, customers returned. One of the returning servicemen was Robert Ernest Sturdy, who, in 1911 was living with his wife, Minnie, and their three year old son, Norman Leslie at 57 Spencer Street, Heaton. 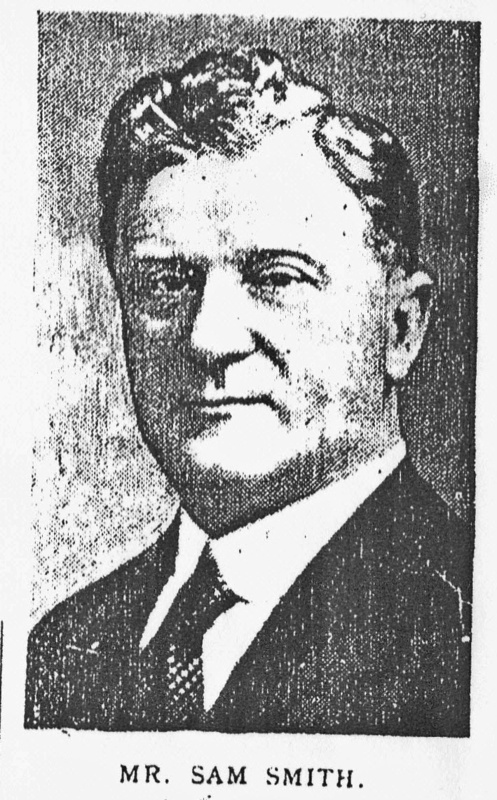 Robert described himself as a ‘superintendent, tea trade’ . By 1916, the couple had two more very young children, May and Ernest. Robert volunteered to join the army, aged 32, in December 1915, just before conscription was introduced early in 1916. He described himself as a ‘manager (drivers)’ . On enlistment it was noted that Robert’s heart ‘seemed weak’. 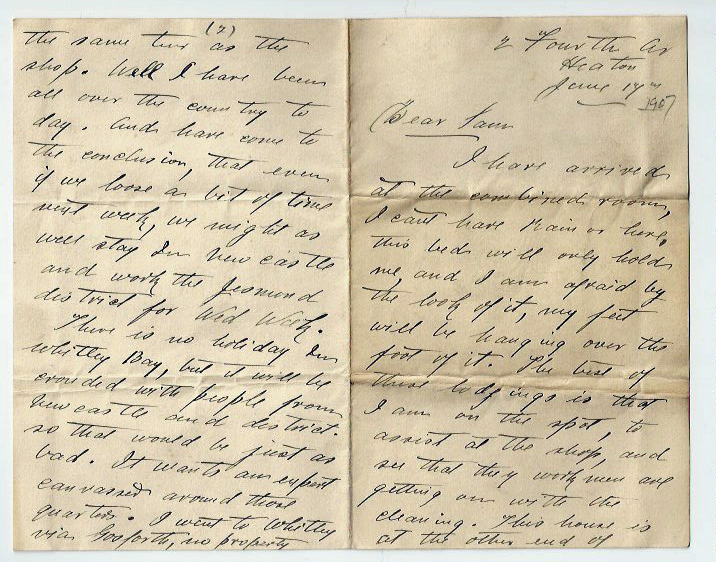 His letter of enlistment stated that he was invited to join the Army Service Corps(Mechanical Transport), ‘provided he has not attained the age of 46 and is found medically fit for Service‘ Despite his heart condition, Ernest was accepted and he served on the home front for just over a month before being sent to France in October 1916. Throughout 1918, he was in and out of military hospitals with conditions variously described as ‘mild debility’, ‘TB‘ and ‘Bronchial catarrh’ before being transferred back to the UK in October 1919, at which time he signed a disclaimer to the effect that he wasn’t suffering from any disability which was due to military service. Robert returned to Ringtons where, as Sam Smith had promised, his old job was waiting for him. He was still there in the position of sales manager in 1934 by which time he was 50 years old. On completion of 25 years service, he was presented with tea and coffee services. Robert died in 1956, aged 73. By this time his son, Norman, was himself described as a tea dealer, presumably (though we can’t be sure) also with Ringtons. Robert’s younger son, Ernest ,was sadly ‘lost at sea’ during WW2. In total there were 14 people in Heaton in 1911 whose occupation, as recorded in the census, included the word ‘tea’. One was Sam Smith, of course, by now living at 129 Warton Terrace, with Ada and their six children. We can’t be sure which of the others worked at Ringtons, as employer names aren’t usually recorded, but Robert Clapperton Mair, aged 15, who lived with his parents, two brothers and a sister, at 13 Charles Street, described himself as a ‘tea merchant’s assistant’. He joined the 10th battalion Northumberland Fusiliers and was posted to France. Robert was one of those who didn’t return, having been killed in action on the Somme on 25 September 1916, aged 20. His name is recorded on the Thiepval Memorial and also on that of Heaton United Methodist Church on Heaton Road. Bothers Patrick and Thomas Sullivan were both ‘van salesmen (tea)‘. The family had moved from Dundee while the boys and their sister, Lizzie, were young and the family lived at 16 Fourth Avenue, just a few doors down from Will Titterington’s lodgings in 1907. When war broke out their father, Patrick, a tram conductor, was active in recruiting volunteers for the ‘Pals‘ regiments and we know that Tom enlisted very early on, in September 1914, at the age of 22. Two years later, by now a sergeant, he was awarded the Military Medal and a Card of Honour for conspicuous bravery and devotion to duty. 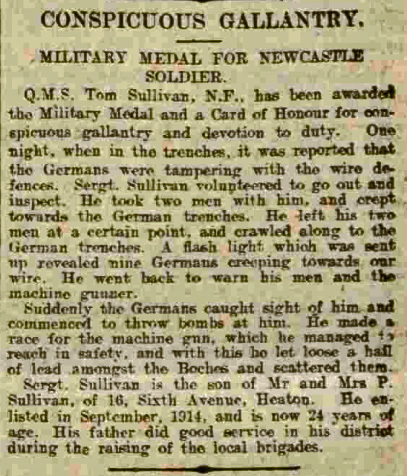 A full report of his actions appeared in the Newcastle Journal, reproduced below. (Despite what it says in the article, the family appears to have lived on Fourth Avenue, rather than Sixth, throughout the war). ‘My mam remembers talk of Uncle Tommy. We knew he’d been awarded the Military Medal but we didn’t know why. Tommy worked for Ringtons tea. He moved to Thornaby near Stockton to work for Ringtons there. He died in the 1940s and had no children. Patrick was exempt from military service because he was colour-blind’. A hundred years later, the personal stories give us a tiny insight into the suffering of Heaton and its people during World War One. But within just a few years, the firm, its staff and customers showed their resilience. Ringtons’ business picked up to such an extent that in 1924 a magnificent, modern building was commissioned on Algernon Road. Work began in 1926 and it was finished in 1928. It still stands, of course, and is much loved, although the firm has since moved again. Not far though. Ringtons’, first managed from a cramped single bedroom on Fourth Avenue, is still very much associated with Heaton. Its headquarters remain on Algernon Road, next door to its impressive 1920s HQ. This article was researched and written by Chris Jackson, with considerable help from Fiona Harrison, for Heaton History Group’s ‘Heaton Avenues in Wartime’ project, which has been funded by Heritage Lottery Fund. An exhibition, ‘’Tea in Heaton’, will be on display at the Chillingham pub from October to December 2015. This article and the exhibition at the Chilli concentrates on the early days in the Avenues and the impact of World War One but it’s just one chapter of the Ringtons’ story. To find out more, pay a visit to Ringtons’ museum in their Algernon Road headquarters and look out for a talk by Fiona in our 2016-17 programme. This entry was posted in Group Activites, Research and tagged Algernon Road, Avenues, Charles Street, Ernest Sturdy, Fourth Avenue, Norman Sturdy, Patrick Sullivan, Ringtons, Robert Clapperton Mair, Robert Ernest Sturdy, Sam Smith, Shields Road, Sixth Avenue, Spencer Street, tea, Third Avenue, Thomas Sullivan, Tynemouth Road, Warton Terrace, Will Titterington, WW1, WW2 on September 23, 2015 by oldheaton. The photograph below shows the premises at 212 Chillingham Road, now occupied by Martha and Mary’s, a community cafe and meeting place, run by volunteers from St Gabriel’s Church. The shop dates from around 1908 and the first occupier, W Wilson, confectioners, appears in the trade directories from 1909 and remained until 1919. The proprietor was William Wilson, who at the time of the 1911 census was aged 48 and living at 10 Heaton Road with his mother and sister, both called Sarah, and his brother, Septimus, who also gave his occupation as confectioner and so presumably worked in the family shop too. William was born and bred in East Newcastle, one of ten children, and he was already describing himself as a confectioner in the 1881 census, when he was aged 18. At that time, he lived with his mother and siblings in Gibb Street, Byker. The boy in the picture is Randolph Cummings, born in 1895. At the time of the 1911 census, Randolph was living with his father, a furniture dealer and four brothers and sisters at 86 Simonside Terrace. Ten years earlier his father is described as a pawnbroker and the family were living in Grosvenor Avenue, Jesmond. Randolph’s granddaughter, Noreen Rees, sent us a copy of the photograph. There is also a copy on display in Martha and Mary’s. The billboard on the right, belonging to the newsagent’s next door advertises a ‘coming revolution in shop hours’. Any idea what that might have referred to? In 1920, the shop was still a confectioners but now went by the name of Mosley and Jamieson. 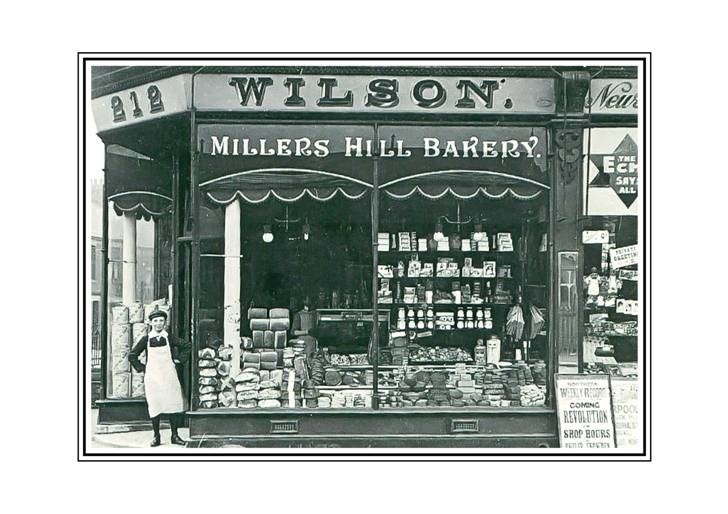 And in the mid 1920s it was referred to in the directories as Millers Hill Bakery. However, as you can see, the photo taken in the early days of William Wilson’s confectionary, before WW1, already includes this name. We’re not sure what the relationship between Wilson’s and Millers Hill would have been. Any ideas? By 1928, the shop had been acquired by the London and Newcastle Tea Company, which was one of the UK’s earliest chain stores. The company had 40-50 branches by 1880 at which time it was the second biggest grocery chain in the country, just ahead of the rapidly expanding Thomas Lipton. The firm had a loyalty scheme in operation as early as 1875, with the network of groceries which sold the company’s tea giving a brass check with each purchase. Customers were invited to save the checks until they had acquired enough to claim a prize such as a toy, an item of crockery or a household gadget. The checks are now collectors’ items but we haven’t seen one stamped ‘Heaton’. Check your drawers! It wasn’t until the late 1960s that the shop changed hands again, when it became Adam’s, a greengrocers. And this is where we need your help. Can you add anything to the information here? Do you have any memories of Adams’ or any of the other shops which occupied 212 Chillingham Road before Martha and Mary’s? Or do you have any old photos of other shops in Heaton? If so, we’d love to hear from you. Contact chris.jackson@heatonhistorygroup.org or comment here. 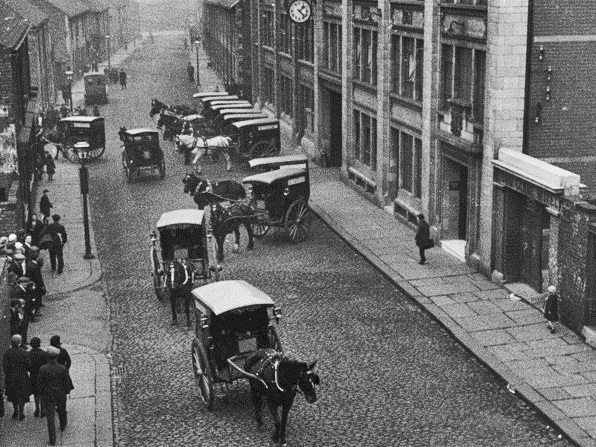 This entry was posted in Research and tagged Adams, bakery, Chillingham Road, Confectioner, greengrocer, London and Newcastle Tea Company, Martha and Mary's, Millers Hill Bakery, Randolph Cummings, shops, St Gabriel's, tea, William Wilson on April 30, 2013 by oldheaton.